18-year-old Ralph Kiner flips his lid at his first pro camp, Perris Hill Park, San Bernardino, CA, 1941. Sent to Albany (A), led league in HRs in ’42, but drafted ’43 & Navy pilot in Pacific; returned to camp (in S.B.) in ’46 making big club for good. 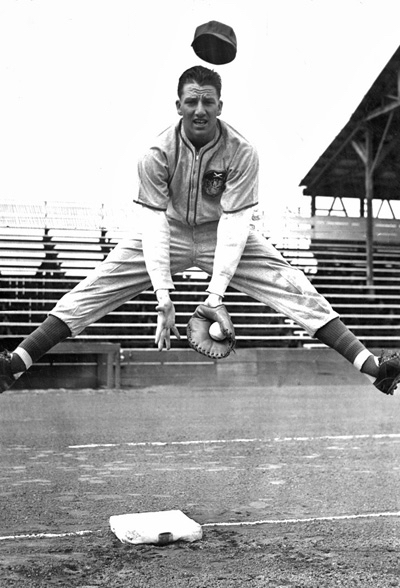 Tom, sensational picture of such a youthful, athletic Ralph Kiner! I remember Kiner as a dangerous home run hitter, but never thought he was Hall worthy. However, in looking more closely at his stats, despite just a .279 lifetime BA, he was quite prolific in his injury-shortened 10 year career. They always say he led the league in homers for seven consecutive years, which is true. But he was tied with Johnny Mize in ’47 and ’48, with 51 and 40, respectively. Also, in 1946 Kiner beat Mize by a single round tripper with 23. “Big Jawn” was back from the war and did have fewer at bats than Kiner that year. So, for three straight years, only a single four-bagger separated the two sluggers!